I'll stick with StartPage. That way I can get the Google results without Google collecting or reporting my metadata. Here's the Wikipedia page on StartPage and their parent company Ixquick. Thankfully, the Dutch government understands and enforces the basic right to privacy. 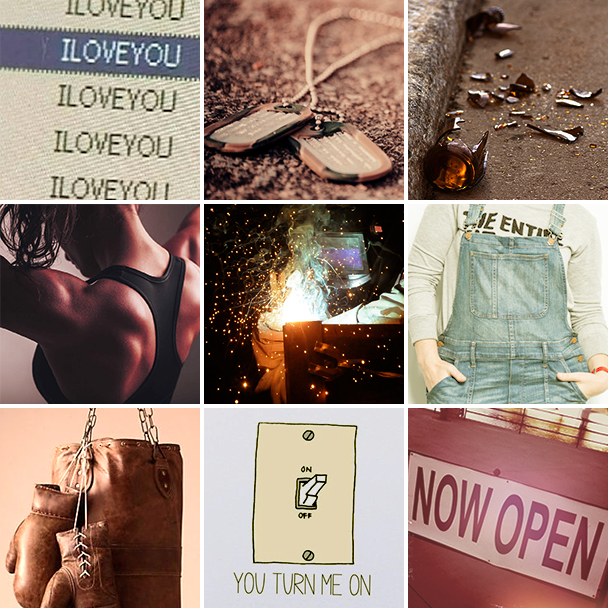 Idk how widely known these things are but a hip thing with the kids on tumblr is making aesthetics / moodboards for characters or ships. Essentially making a collage of photos and images that when put together capture the "Aesthetic" of the character or relationship in question, or are simply just images of things that relate to them. It's neat. So, ok. I see Faye's overalls, "now open" for their business, the broken bottle is Faye's drinking problem, the dogtags for...Bubbles' time spent in the military? them loving each other, being turned on by each other, Bubbles' punching bag...? I love that I can see two that are definitely Faye and two that are definitely Bubbles. And their traumas (Bubbles' military service, Faye's drinking). And then three that are what they share (love, being turned on, Union Robotics). So, ok. I see Faye's overalls, "now open" for their business, the dogtags for...Bubbles' time spent in the military? them loving each other, being turned on by each other, Bubbles' punching bag...? I love you = Faye loves Bubbles ...and Bubbles loves Faye. Athletic Pose = Faye got buff. Bubbles always was buff. Bubbles often wears athletic gear in public. Welding = Faye is an experienced welder. Their business is mostly metalwork. Coveralls = Faye's current style. Punching bag = Bubbles's punching bag/s. Maybe also Faye's habit of punching people? Light Switch = Sudden realization of sexual desire. Now open = Newly developed and hard won capacity for emotional intimacy. Also Union Robotics. The other portion of the punching bag is when Faye almost fell off the wagon, but didn't - she vented the stress by beating the crap out of a punching bag. Ohhh. I couldn't even see the welding picture. I couldn't see what it was. 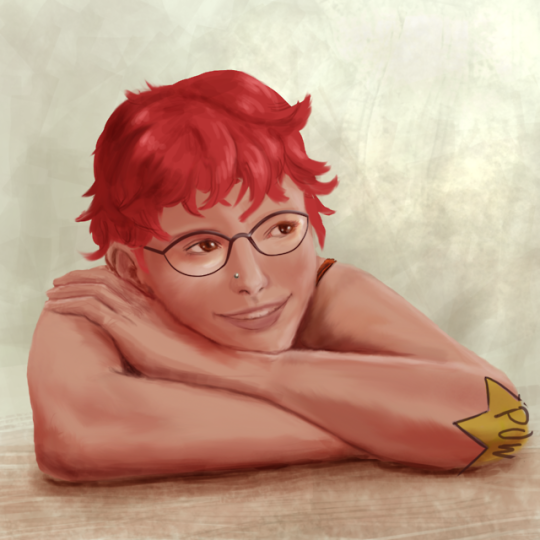 No art, but uh, I tried to draw my avatar and stopped before I died of embarrassment. My drawing skills are not good...I need to work on it. Those of us who've been around for a while know how hard Jeph's worked on his art - I seem to remember a session of life drawing classes he alluded to in the newsposts at one point. Spookybot are so smug, they can tango with themselves. Please come back to share more if you want. Amazing work! I really like the detail on the shading under the tattoo. The expression and pose feel very Tai as well. First, it may sound hard to believe, but Google not only Just Doesn't Care about you personally, Google actively really doesn't want to know anything about you personally. As far as Google is concerned, you're a cookie, not a person -- and, for what it's worth, it wants you to stay that way. What it don't know, it can neither be forced to reveal, nor, worse, reveal by accident. Second, and more important, Google's really not the real risk to your privacy out there. Fact is, you leak metadata all the time. When you logged in to make a comment here? You left a trail of cookie crumbs. When you apply for a professional license, you left a cookie crumb. Every been bankrupt? Ever been in default on a line of credit? Ever had a cell phone? There are companies aggregate and sell those trails of cookie crumbs. It's among the kind of stuff that the credit rating agencies (and "alternative credit agencies") sell. Did you or did you not vote in the last election? That's a public record, and somebody, somewhere, has aggregated it with other data about you and packaged you -- and this is the real person, you -- up and sold you to somebody else. Probably to a lot of somebody elses. In some states, if voted in a primary, the party in whose primary you voted in was kept as a public record. Yes, someone can figure out your political affiliation from the records in the county courthouse. Ever use a credit card or a debit card? That information's for sale, although the purchasers have to meet certain requirements about data storage and usage to purchase it. That's OK, though, they can buy versions of the data without the PII (personally identifiable information) obscured without those restrictions. It's cheaper, too. I know security researchers who've looked at the problem of figuring out how to beat that kind of obfuscation. They tell me that it really isn't very hard. I believe them. Spookybot. They're not just in QC any more. I won't deny that Google could be a threat to your privacy, although it really doesn't want to be. Facebook and Amazon *are* risks to your privacy, although Amazon takes protecting it seriously. I wish I could confidently say the same about Facebook. But the real risks to your privacy? They're here in meatspace, not out there is cyberspace. Not sure how much this counts as fanart, but a friend told me she wished the thought bubble of Brun had included the Kiki Bow, and I couldn't resist the urge to draw it in. 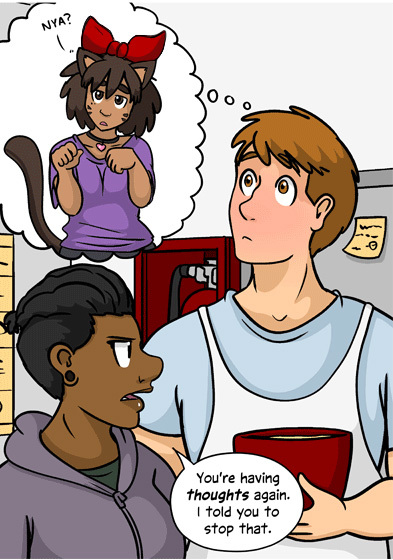 So, you're saying that Brun is a former faunus freedom fighter from the planet Remnant? I was thinking of using that doll maker to do up a version of Durian, Kiwi, and Peach (the winners of last week's poll). 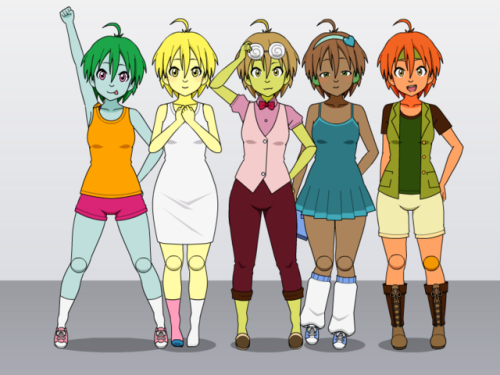 Since each of the fruit sisters seems to have some sort of quick (physical, behavioral or psychological), does anyone have any suggestions for them? While logical, Durian smelling bad feels kind of mean to do. 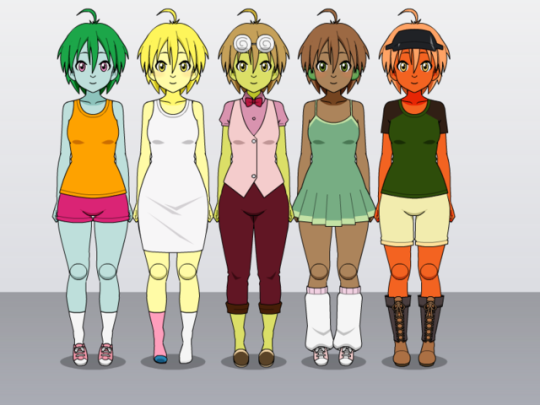 Screw it, here are their tentative designs standing next to Melon and Lemon. These designs are super tentative. Their hair colors are derived from the main exterior color of the fruit, skin color from the secondary exterior color, and eye color from the interior color of the fruit. Durian seems to be the most put together. Is that a welding mask on Peach's head? It's meant to be a sun visor. And now she's got a green denim vest thing. I did some fiddling with the colors, switched Peach's hair and skin tones, and opted to give Peach a slightly mismatched knee cover. She's also now got a headband instead of a visor. And, Kiwi now has a book. 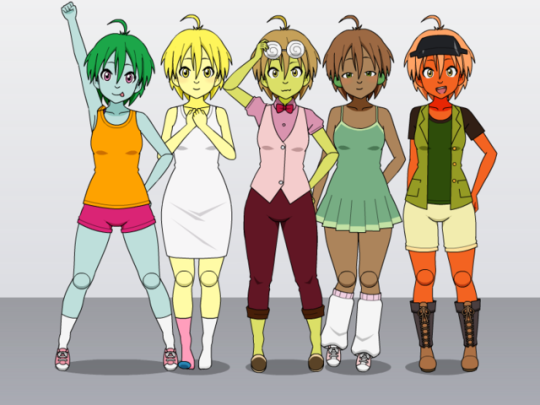 I think I like Kiwi's original dress color. It just looks softer for some reason. I imagine her as being a bit shy and maybe a little bookish. Whereas Peach is more of a tomboy and probably the closest any of them come to Faye's personality (unless there's a Prickly Pear). Anyone know why twitter imagine locations don't work?